National Geographic has a documentary on stress entitled, “Stress: Portrait of a Killer”. It highlights the work of Stanford University professor, Robert Sapolsky who has studied "stress" for much of his career. The doctor describes, "...The human stress response has saved our lives. Today, we turn on the same life-saving physical reaction to cope with intense, ongoing stressors - and we can’t seem to turn it off." The Institute is frequently asked to construct lists of stressful occupations but such rankings have little importance. It is not the job but "the person-environment fit that matters. Some individuals thrive in the time urgent pressure cooker of life in the fast lane, having to perform several duties at the same time and a list of things to do that would overwhelm most of us — provided they perceive that they are in control. They would be severely stressed by dull, dead end assembly line work enjoyed by others who shun responsibility and simply want to perform a task that is well within their capabilities." 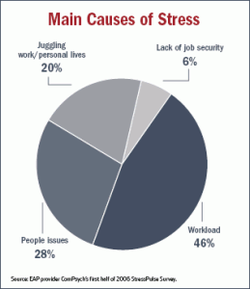 Stress is a highly personalized phenomenon but we all seem to be experiencing it in significant quantities. 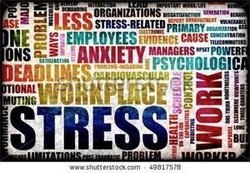 Here are some numbers from the CDC, the National Institute of Occupational Safety and Health (NIOSH) and the American Institute of Stress. Create a "Highly Productive, Best Place I've Ever Worked Environment"
This simple but unique approach enables organizations to understand their needs, the basic relational elements of a team, evaluate those needs effectively and identify roadblocks to achievement. All of this transacts in a "best place I've ever worked" environment that engenders support and inspires excellence.